"Go on a date with a soldier turned police officer? Me? And discuss Gandhi's experiments with truth with a gun-toting Republican?""" The last thing Berkeley-dwelling peace activist Sophia Raday expected was to fall in love with a straightlaced Oakland police officer. As someone who had run away from cops dressed in riot gear at protests, Sophia was ambivalent, to say the least, at the prospect of dating Barrett, who was not only a cop but also a West Point graduate, an Airborne Ranger, and a major in the Army Reserve. During their courtship the two argued about many of the matters that divide the United States, things like drug policy and race relations. Startled by the freedom she found in a relationship of differences, by the challenge of sparring with Barrett, and by his steadfast acceptance of her, Sophia unwittingly fell in love. Then, just when Sophia believed her family was starting a new chapter with the birth of their son, came September 11. Barrett's belief that he must always stay in Condition Yellow--the terminology coined by his favorite Guns & Ammo writer for a state of alert in which you realize your life is in danger and you may need to shoot someone--was suddenly in the forefront of their lives. Sophia and Barrett began to confront, on a very personal level, their differing viewpoints on polarizing values like fear, duty, family, and patriotism. When Barrett's military duties escalated along with the country's, Sophia found herself in the surprising position of military wife, living on an army base during the 2004 elections, and struggling to find peace with herself and her husband in this new world. It was a struggle that would continue up to the point of Barrett's deployment to Iraq. 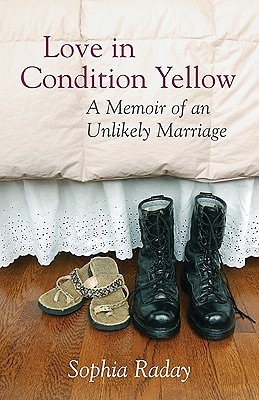 "Love in Condition Yellow" not only provides a vivid, poignant portrait of this unusual union, but also tells the larger story of how love doesn't necessarily come from sameness, and peace doesn't necessarily come from agreement.